If you are like me, it was always hard for me figure out what to give my dad for Father's Day. After all he already had everything that he needed. Usually he would make it even harder by going shopping for himself to get what he really wanted! I've got an idea for something special that could not be bought in a store. A KAFFE FASSETT TIE!! It only takes a yard of fabric. 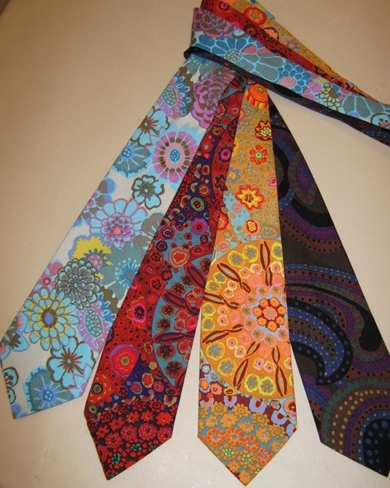 I used an old tie for a pattern and sewed it back together the same way it was put together. I do have to tell you that the point of the tie is a bit tricky. You may want to sew that part by hand to avoid frustration. You can make one in a day so there is still time for to make one before Father's Day. Be sure to take a picture when he proudly wears it to work! !